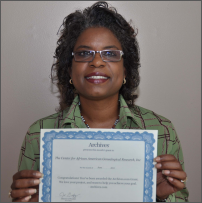 The latest Archives.com Grant was awarded to The Center for African American Genealogical Research, Inc. (CAAGRI), a non-profit organization that works to reconnect African families torn apart by the slave trade. CAAGRI's methods incorporate both traditional genealogy and DNA studies, which will help people around the world to trace their roots back to Africa. They also are engaged in an ongoing project to digitize the holdings of the the Public Records and Archives Administration (formerly the National Archives) in Ghana. This project started in April 2010, and over one million records have been digitized thus far. The goal is to provide visitors with easy access to the digital records via donated computers, and to preserve the original documents which have deteriorated due to exposure to light, hand oils, and poor storage. Of particular concern to the organization was the inadequate storage of the historical documents. Archives' $1,000 dollar contribution to the project will fund the purchase and shipping of acid free storage containers which will help to protect the documents through the foreseeable future. CAAGRI founder and CEO Paula D. Royster said, "The grant we received from Archives.com not only furthers our desire to help preserve historical documents wherever we can but it will directly impact the history of an entire nation and for that, we are very grateful." Archives is pleased to help CAAGRI and the Public Records and Archives Administration in Ghana to safeguard these fragile, historically significant documents. If you're interested in learning more about CAAGRI's project in Ghana please visit their website. Also, Archives.com has several resources available to those tracing their African roots. Read articles written by expert authors here. Archives is proud to have awarded thousands of dollars to genealogy and historical preservation projects in 2011. Congratulations to CAAGRI! We applaud their mission to protect historical documents, and provide easier access to these important African collections.